Star of the Game. Brandon Ashley. The ‘Cats junior forward has been good all year. He didn’t make the All-Pac-12 team (all 15 spots that the conference awards over two teams), although he did make the RTC All-Pac-12 second team. But he’s been good. Today, he was great. His stats indicate as much – a career-high 24 points on 11 field goal attempts, seven boards, a block, an offensive rating off the charts – but they don’t begin to sum up the impact he had in this game. Knocking in jumpers when the Wildcats were struggling to find offense; putting in contested, twisting shots at the rim; challenging UCLA bigs Tony Parker and Kevon Looney at the rim. 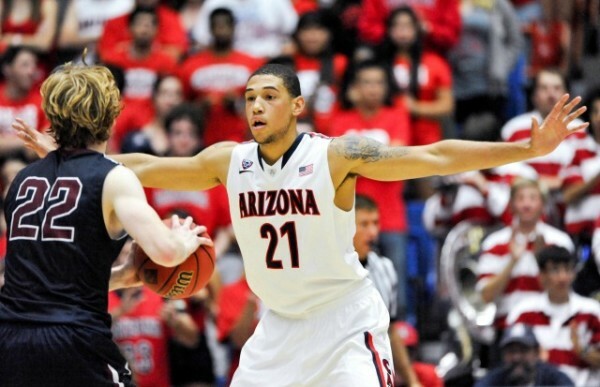 And, don’t for a second think his enormous contribution got by head coach Sean Miller. “I told Brandon this was the best game that I’ve seen him play at Arizona just because every basket and everything he did had great meaning. And that was from the start of the game to the end.” Miller went on to talk about Ashley’s recovery from his broken foot last season. Sights and Sounds. 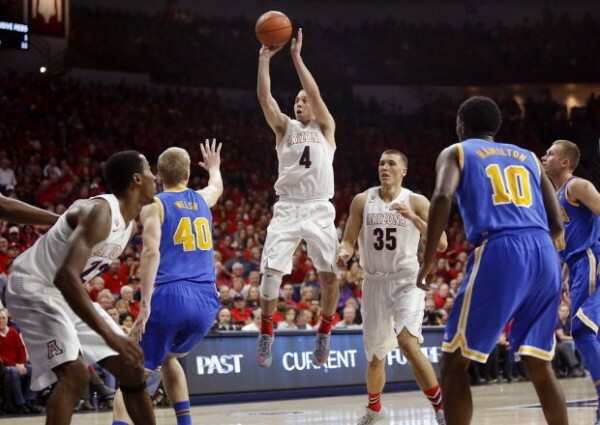 McKale Center – MGM Style. The Pac-12 plays its conference tournament on a “neutral floor.” And yes, while the floor may indeed be neutral, the crowd in the stands at the MGM is certainly not. Somewhere in the neighborhood of 90 percent of the arena was decked out in red on Friday night. Certainly, some not insignificant amount of those wearing red were in fact Utah fans, but beyond any doubt, the vast majority of fans here were rooting for the Wildcats, with only a small section of UCLA partisans. What’s Next? Arizona plays tomorrow at 8:00 PM against the winner of Utah and Oregon. UCLA, meanwhile, waits. And sweats. They are as bubblicious as bubble teams get. Sure, Steve Alford and Sean Miller both agree that the Bruins are among the best at-large teams in the country, but neither of those guys gets a vote on the Selection Committee. And, as Miller points out: “They do it by numbers.” And what are the numbers? UCLA’s RPI is #65: not good. Two wins over teams in the top 30 of the RPI. Another three over teams #31-#100. A lot of missed opportunities. UCLA can’t be particularly confident of its chances to earn an NCAA invitation this weekend. This entry was posted on Friday, March 13th, 2015 at 11:01 pm by Andrew Murawa (@AMurawa)	and is filed under 2015 conference tournaments, microsites, pac 12. Tagged: arizona, Brandon Ashley, feature, kevon looney, norman powell, rondae hollis-jefferson, sean miller, Stanley Johnson, steve alford, t.j. mcconnell, tony parker, ucla. You can follow any responses to this entry through the RSS 2.0 feed. You can leave a response, or trackback from your own site.